The Share App plugin is a great way to get people to download your app! What is the Share App Plugin? 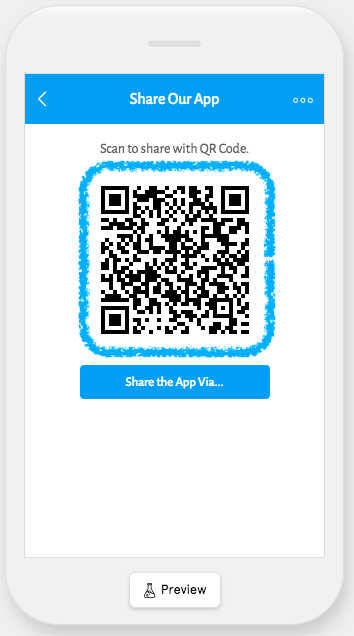 This plugin is all about getting more people to download your app, and with the Share App plugin your users can bring up a QR code or a link to share your app via Social Media, Email, SMS Text, and more with just a tap! What are some use cases of Share App Plugin? If you have an eCommerce app, you can use the Share App plugin to not only bring new users to your app, but also use it as a marketing tool for your product! You can use the Share App plugin for your Restaurant app to provide new users with information about your restaurant or its signature dishes that accompanies a link to your app in the app stores. For your Church app, you can use the Share App plugin to send out an encouraging message along with a link to your app in the app stores. What is the Share App Plugin’s primary function and what are the steps to accomplish it? The Share App plugin provides two distinct ways for users to share your app! 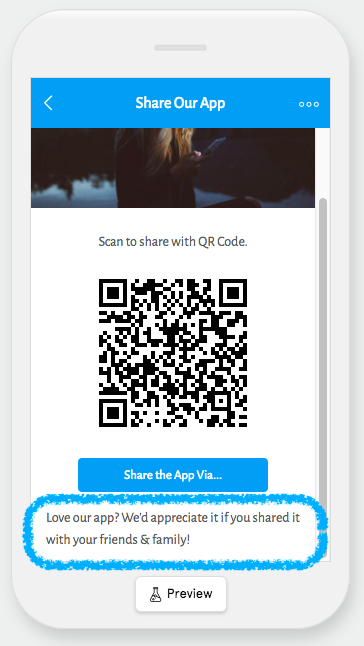 Users can share it by using the QR Code that we provide or the “Share the App Via…” button. Let’s go through both ways to show you how to set them up and how they function in the app, then we’ll go over the other elements of the plugin that you can use to make it unique to your app. Note: In order for the Share App plugin to work, your app needs to be live in the iTunes and Play stores, and the Store Listing Links need to be uploaded to the Share Settings in the Dashboard. You can read more about the Share Settings here. In order to make sure the QR Code takes the new users to the right app, you’ll need to add the Store Listing Links for both the iOS App and Play stores “Share Settings” section of your control panel. You can read more about the Share Settings here. 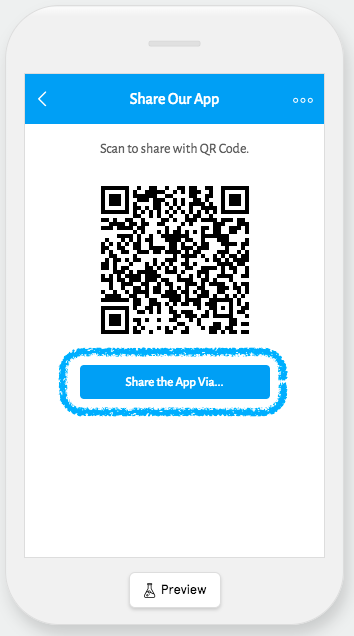 Once you’ve uploaded the Store Listing Links to the Share Settings in the Dashboard, all you need to do to activate the QR Code is to add the plugin to your app either in the Home Screen or the Side Menu of your app. Now that the QR Code has been activated, all people need to do is open up a QR Code scanner on their phone and scan the QR Code directly off your user’s phone’s screen! Our system can detect their device type, so if they’re using an iPhone, they will be taken to the iOS App store listing, or if they’re using an Android phone, they will be taken to the Play store. Alternatively users can share the app using the “Share App Via…” button which we will go over now. The “Share the App Via…” button allows people to share your app on different platforms such as Twitter, Facebook, Email, Text Message, and more! Just like the QR Code, you need to make sure your app’s Store Listing Links have been added to the Share Settings, that way the link that users share will direct people who tap on it to the correct app store for their device. Step 2: Check out all the ways users can share your app by tapping on the “Share the App Via…” button! As long as the Store Listing Links have been uploaded and the plugin has been added to your app, all users need to do is open the plugin and tap on the “Share the App Via…” button to see all the ways that they can share your awesome app! Now let’s go through some of the other elements of the Share App plugin that you can use to make it more unique to your app! 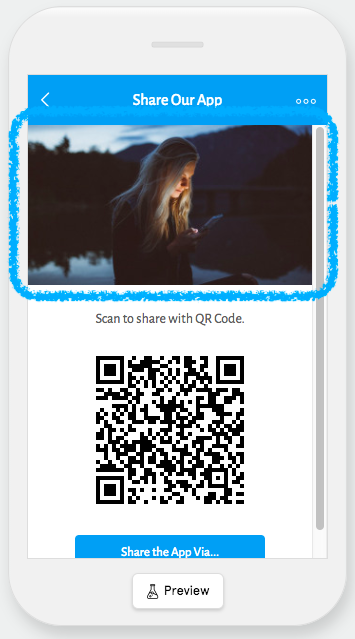 With the Image Carousel you can add an image, or a couple of images above the QR Code to help personalize the plugin! You can use this to display something such as your logo or give people a thank you message for sharing your app. The options are almost limitless! If you need help with how to use the Image Carousel, we have a dedicated article which you can check out here! The Content Body allows you to add text within the plugin that displays below the “Share the App Via...” button. You can use this as a way to incentivize users to share your app, give a thank you message, or you can just leave it blank, it’s up to you! This part of the plugin is powered by our Text WYSIWYG, which you can learn more about here! The Share Message allows you to include a special message that will accompany the link to download your app that is sent out when users use the “Share the App Via…” button. This gives you a great opportunity to promote your app with a message like “This 5-Star restaurant has an awesome menu!” or give new users an incentive for downloading your app with a message like “Download this app and get a $5 coupon!”. Ask yourself — what would be someone’s main motivation when downloading and using your app? The more creative you are the more engaging users posts will be when they share your app! With the Share App plugin your users can share your app on many different platforms. Use this to your advantage to encourage them to organically share your app through word of mouth. This helps you to engage with your current users and cut down on marketing costs for your app! You can use the Image Carousel, Content Body, and The Share Message to add a personal flair to the Share App plugin! Use these as an opportunity to market your app, thank your users for sharing the app, or simply make it more specific to your app to help it fit in with the rest of your app’s feel and branding. Providing incentives for your users to share the app can not only help you get new downloads for your app, but also help you engage with your pre-existing users! We have a great article on how to create engaging notifications which you can check out here! As we mentioned before, you’ll need to include links to the Store Listings for your app in order for the Share App plugin to work, but did you know that you can use the Share Settings in conjunction with the Share App plugin in some interesting ways? Using the Store Listing Links is the default way that the Share App plugin works, but did you know that you can supply your own links? If you don’t want to send users directly to the App Stores, you can create your own download links on your website and upload that link to your app’s download pages to the Share Settings. This would allow you to track how many people click through or you can build your own landing pages that the Share App Plugin can link to. You can read more about the Share Settings here. Note: In order for this to work, you will need to create and maintain your own download or landing page outside of the BuildFire system. The Share Settings are just used for linking to whatever links you enter into that section of the App Dashboard.